Okezie Ikpeazu, Governor of Abia State on Monday received five of his colleagues from the northern part of the country. While addressing them inside the executive chamber of the government house, Umuahia, Ikpeazu said, “we won’t allow an infinitesimal few to separate us”. Ikpeazu expressed gratitude to the northern delegation for coming to show solidarity with the people of Abia. 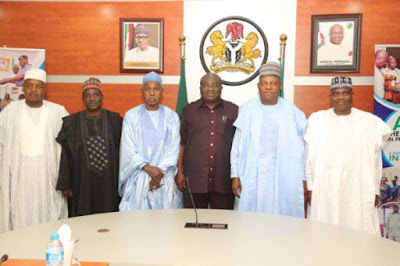 The governors, who visited the state were Kashim Shettima (Borno), Aminu Tambuwal (Sokoto), Aminu Masari (Katsina), Simon Lalong (Plateau) and Atiku Bagudu (Kebbi). Earlier, Shettima, who is chairman of the northern governors’ forum, said the delegation had earlier met Nyesom Wike, governor of Rivers. He appealed to the people of the south-east zone to have faith in a united and indivisible Nigeria. “On behalf of northern governors’ forum, we are here to commend Governor Ikpeazu on his high-quality leadership in handling the crisis in Abia. “He rose to the occasion and declared a curfew in Aba just as Governor Lalong also declared a curfew in Jos to avert a reprisal attack on the Igbo. “We are here to show solidarity. We have a moral obligation to ensure that Nigeria remains one. Nigeria is the largest conglomeration of black people in Africa and we cannot afford to separate. "If the nation disintegrates, where will we go? North is the Sahara desert and Chad cannot contain us. If we go south, it is the Atlantic Ocean. South is too small for us and the mountains of East Africa with their so many challenges cannot accommodate us,”‎ he said. Shettima said Nigeria had come a long way as a nation with rich diversities, hence, the need to sustain the country’s unity. He said it was in the interest of all Nigerians to stay together and work to build a strong united nation. "We are here to remind Nigerians that we are better as one. We are here to also invite our south-east colleagues to also come to the flashpoints of the north to speak to NdiIgbo living in the north,” he said.